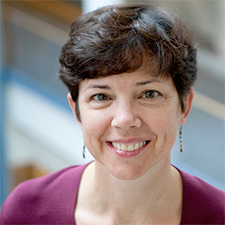 Professor Deegan’s research focuses on the dynamics of non-equilibrium systems. As a system, such as a fluid or a solid, is driven from equilibrium, it undergoes a series of transitions to progressively more organized dynamics. Everyday examples of this phenomenon are the bands of Jupiter, the Giant’s Causeway, and the crumpled edges of lettuce leaves. 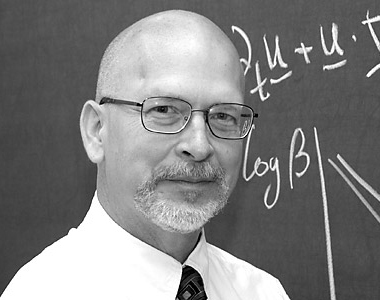 Professor Deegan studies dynamical transitions though table-top experiments with the aim of understanding the origin of this behavior in each specific case and in general. His research covers a broad range of phenomena from drying drops to bursting balloons to vibrated slurries. 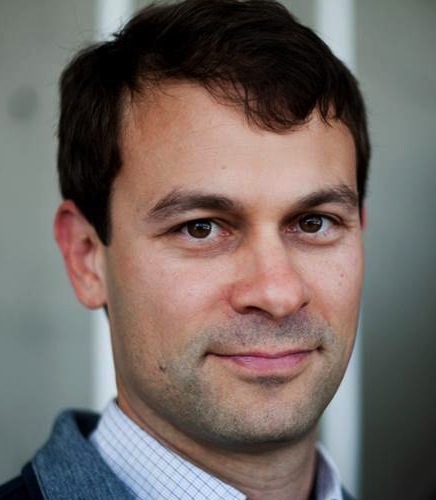 Bryan Goldsmith is an Assistant Professor in the Department of Chemical Engineering. His works focus on the development of novel catalysts and materials. The world is facing a growing population, mass consumerism, and rising greenhouse gas levels, all the while people strive to increase their standard of living. 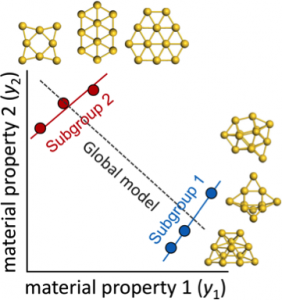 Computational modeling of catalysts and materials, and making use of its synergy with experiments, facilitates the process to design new systems since it provides a valuable way to test hypotheses and understand design criteria. His research team focuses on obtaining a deep understanding of catalytic systems and advanced materials for use in sustainable chemical production, pollution abatement, and energy generation. 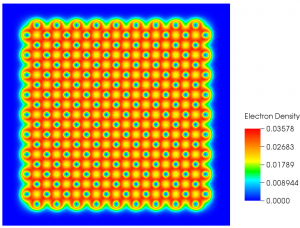 They use first-principles modeling (e.g., density-functional theory and wave function based methods), molecular simulation, and data analytics tools (e.g., statistical learning and data mining) to extract key insights of catalysts and materials under realistic conditions, and to help create a platform for their design. 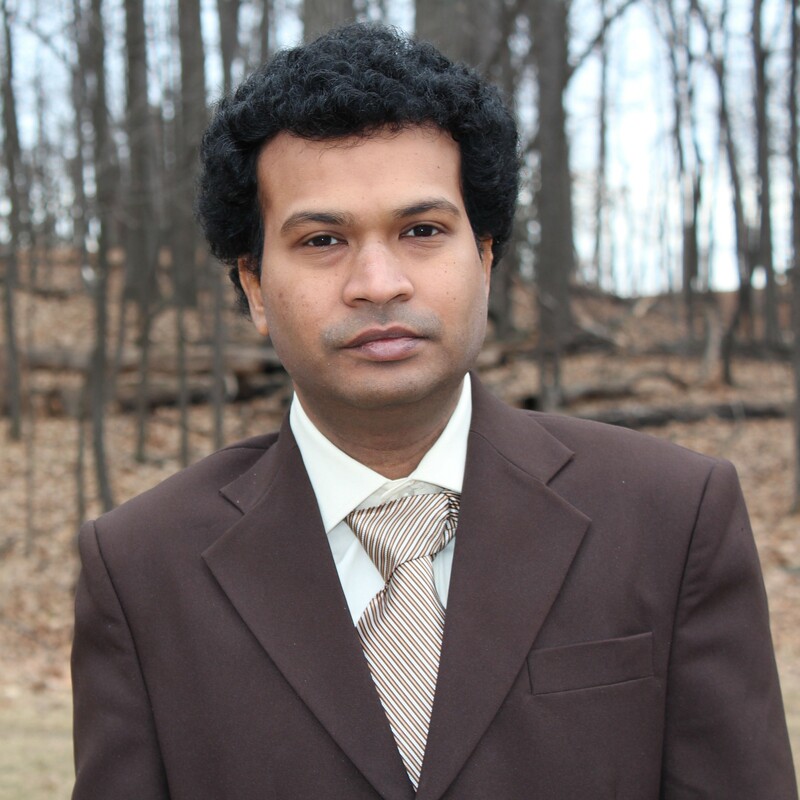 Phani Motamarri is an Assistant Research Scientist in the department of Mechanical Engineering. 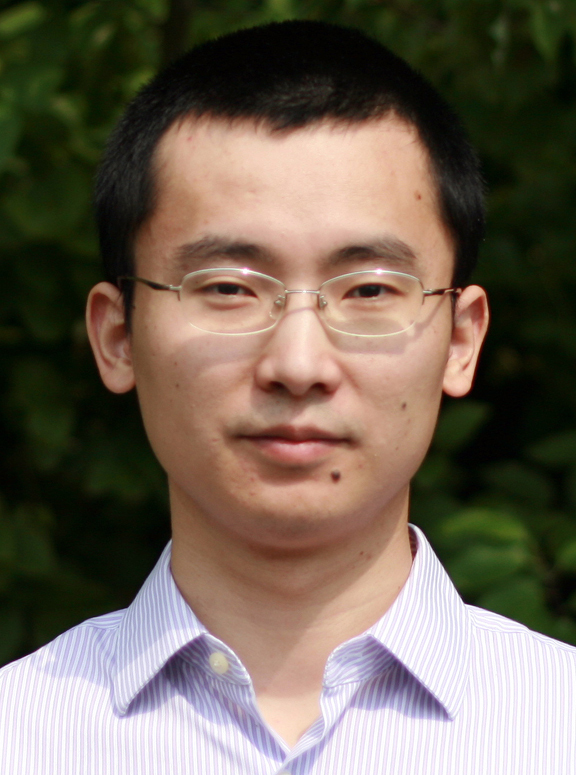 His research interests lie in the broad scope of computational materials science with emphasis on computational nano-science leading to applications in the areas of mechanics of materials and energy. 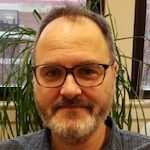 His research is strongly multidisciplinary, drawing ideas from applied mathematics, data science, quantum-mechanics, solid-mechanics, materials science and scientific computing. The current research focus lies in developing systematically improvable real-space computational methodologies and associated mathematical techniques for conducting large-scale electronic-structure (ab-initio) calculations -via- density functional theory (DFT). 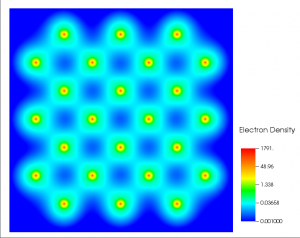 Massively parallel and scalable numerical algorithms using finite-elements (DFT-FE) are developed as a part of this research effort, which enabled large-scale DFT calculations on tens of thousands of atoms for the first time using finite-element basis. These computational methods will aid fundamental studies on defects in materials, molecular and nanoscale systems which otherwise would have been difficult to study with the existing state of the art computational methods. Current areas of application include — (a) first-principles modelling of energetics of point defects and dislocations in Al, Mg and its alloys which are popular in light-weighting applications to provide useful inputs to meso-scale and continuum models, (b) providing all-electron DFT input to advanced electronic structure approaches like the GW method for accurate prediction of electronic properties in semiconductor-materials. 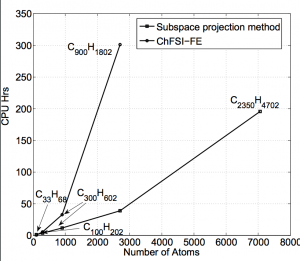 Computational time (CPU-Hrs) per SCF iteration for the reduced-scaling subspace projection method and conventional diagonalization approach(ChFSI-FE). Case study: Alkane chains upto 7000 atoms. Don Siegel is an Associate Professor affiliated with the Mechanical Engineering Department and the Department of Material Science and Engineering. His research targets the discovery, characterization, and understanding of novel materials for energy-related applications. 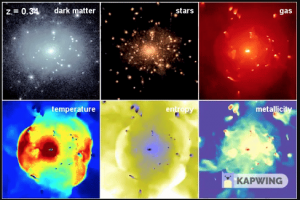 These efforts primarily employ atomic scale modeling to predict thermodynamic properties and kinetics. These data provide the necessary ingredients for identifying performance limiting mechanisms and for the “virtual screening” of candidate compounds having desired properties. 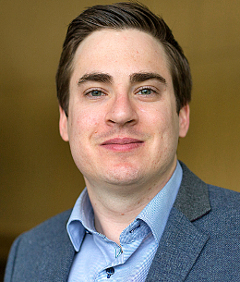 Prof. Siegel is currently exploring several varieties of energy storage materials, lightweight structural alloys, and materials suitable for use in carbon capture applications. 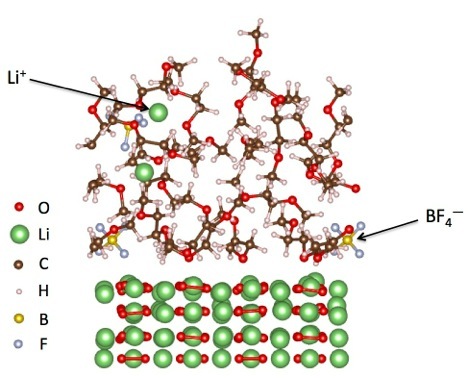 Atomic scale model of a liquid electrolyte/solid Li2O2 interface in a Li-air battery cathode. 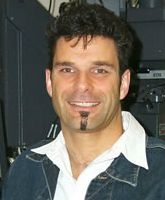 Professor Becker leads an interdisciplinary group to understand problems in surface geochemistry and computational mineralogy, thus there are research opportunities in fields ranging from experimental approaches and computational modeling of actinide geochemistry (U immobilization in the environment, actinide-containing solids under extreme pressure, temperature, and radiation, U/Np/Pu redox processes) to carbonate biomineralization. Other research includes calculating redox processes (including resolving individual kinetic barriers that control kinetics) carbonate and phosphate biomineralization (from environmental applications to processes on teeth). As a part of Mineralogy and Materials Science Research Group, Becker’s group interacts with Radiation Effects and Radioactive Waste Management group, Michigan Geomicrobiology group, Electron Microbeam Analysis Laboratory (EMAL) and Mineral Physics group. Band decomposed charge density associated with the defect state at -0.7eV, introduced by Pu occupying the A site in Ca3Zr2(FE2Si)O12. 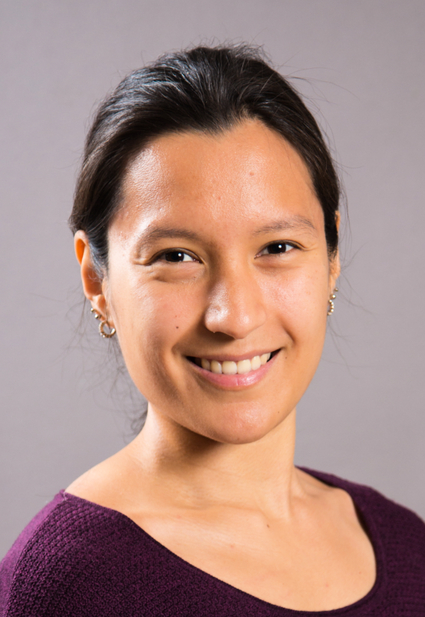 The Linderman group works in the area of computational biology, especially in developing multi-scale models that link molecular, cellular and tissue level events. Current areas of focus include: (1) hybrid multi-scale agent-based modeling to simulate the immune response to Mycobacterium tuberculosis and identify potential therapies, (2) models of signal transduction, particularly for G-protein coupled receptors, and (3) multi-scale agent-based models of cancer cell chemotaxis. 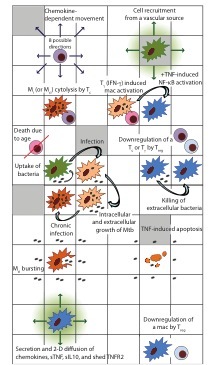 Hybrid multi-scale model of the immune response to Myobacterium tuberculosis in the lung. 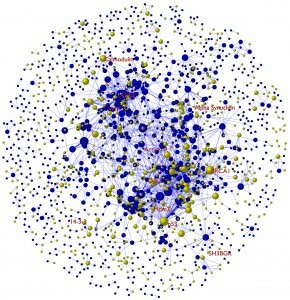 Selected immune cell behaviors and interactions captured by the model are shown. Not shown are single cell receptor/ligand dynamics involving the pro-inflammatory cytokine tumor necrosis factor (TNF) and the anti-inflammatory cytokine interleukin 10 (IL-10).